Richard Sakwa, Professor of Russian and European Politics at the University of Kent, scares me. 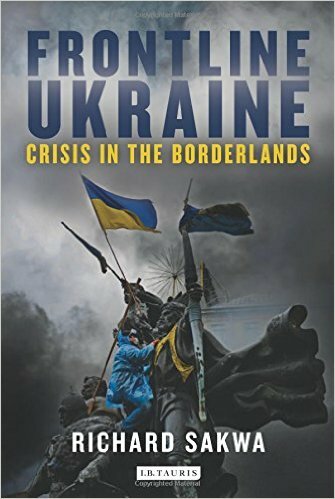 He compares in Frontline Ukraine the current international tensions over Ukraine with those over the Balkans prior to World War 1. He further compares the dynamics between NATO/”Wider Europe” and Russia with those between Western Europe/UK and Germany prior to World War 2. So far I have only read the first two chapters but I read them while the news was hailing as historic the rise and rise of Hillary Clinton towards the White House. And that makes the insights and warnings of Sakwa’s book even more scary. Sakwa documents Hillary Clinton’s attitude towards Russia as epitomizing the worst of the blindly destructive and culpably foolish that beset the leaders who stumbled into war in 1914. I found Sakwa’s description of Ukraine, both historical and contemporary, most enlightening. I had not grasped just how deep-seated are the roots of the divisions in Ukraine that we are now witnessing, or how ancient is some of the puerile and fascist sounding anti-Russian talk coming out of Ukraine’s leaders today. Nor had I realized how equally ancient are the voices of pluralism seeking partnership with Russian and other Slav peoples. Most depressing is the way the EU has tied itself to advancing the very divisions and conflicts in Europe that it was originally founded to obliterate. There is a pattern expressed in the books I have been reading. Afshon Ostovar in Vanguard of the Imam shows how the Iranians in response to 9/11 were offering much practical information and assistance to the United States to enable them to locate and capture the al Qaeda and Taliban targets they most wanted, but how the US rebuffed these efforts because they came from Iran. Sakwa shows the same pattern of Western rejection of anything coming from an increasingly demonised Russia. A very different approach was adopted by Hillary Clinton as Secretary of State in President Barack Obama’s first administration from 2009 to 2013. In her memoirs Hard Choices she stresses US global leadership and the country’s commitment to democracy and human rights, which is hardly surprising, but more disturbing is the harsh inability to understand the logic of Russian behaviour. 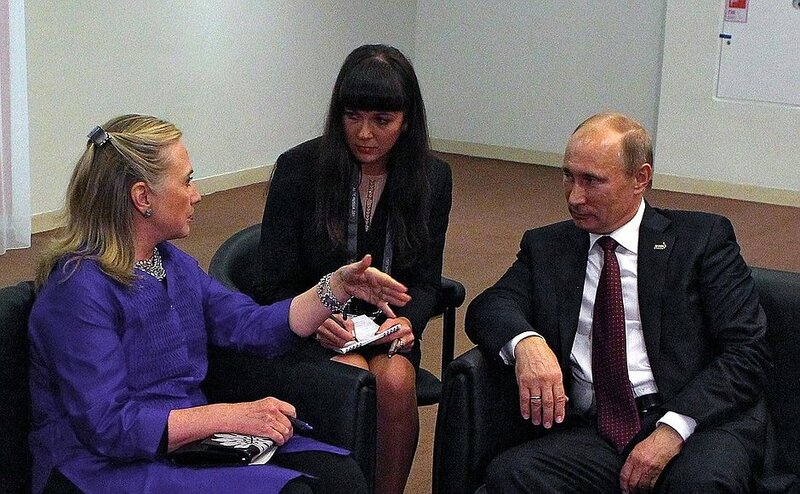 As long ago as 2008, during her failed presidential bid, Clinton asserted that Putin, as a former KGB agent, ‘doesn’t have a soul’, to which Putin riposted that anyone seeking to be US president ‘at a minimum […] should have a head’. She interpreted actions in support of independent Russian political subjectivity as an aggressive challenge to American leadership, rather than the normal expression of great-power autonomy in what Russia considers a multipolar world of independent nation states. She takes a consistently hawkish view of the world, urging Obama to take stronger action in Afghanistan, Libya and Syria, but when it comes to Russia her views are particularly harsh and unenlightened. She considers Putin a throwback to a nineteenth-century world of zero-sum realpolitik, intent on rebuilding the Russian Empire through Eurasian integration. Through this prism, she interprets Russian actions in Georgia in 2008 and in Crimea in 2014 as part of an aggressive strategy, rather than as defensive reactions to perceived challenges. A place to discuss questions relating to biblical questions that are not covered in posts on this blog is at Biblical Criticism & History Forum. Check it out. It’s a pretty comprehensive site. I sometimes drop in with a point of view or response to others. I am sure there must be others around. I have not been to serious academic discussion lists for a while now but I think some of those also allow amateurs to join and occasionally raise questions. There are also many blogs run by biblical scholars who would be happy to discuss a range of questions. And there is of course Rene Salm’s Mythicist Papers but I suspect Rene would also appreciate comments and questions relating to the topics of his posts. If you know of any sites of interest then do add them in the comments below.